I would like to hear from anyone who is familiar with the history behind the name of this dish. Please share with us. This recipe seems lengthy and complicated, but it is rather simple to prepare, and a great dish for parties, pot luck dinners, picnics, and Super Bowl Parties. 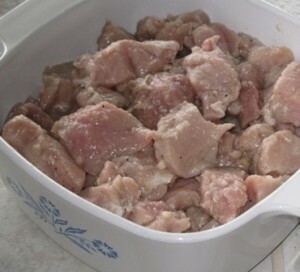 Cut the meat into 1 inch cubes, and place in a large bowl. 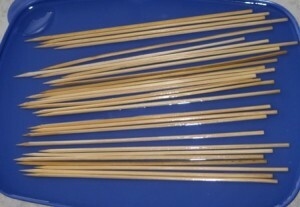 Soak the skewers in water for at least 10 minutes, before using. Leaving about 2 inches at the bottom of each skewer, arrange pork cubes on the skewers. 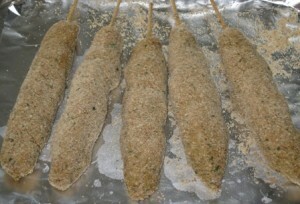 Roll the skewered pork in bread crumb mixture, to coat evenly. 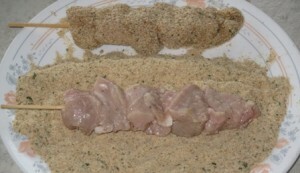 Dip the bread crumb coated pork into egg wash.
Dip for the second time in the flavored bread crumbs. 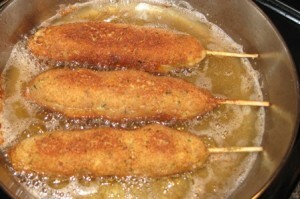 Heat the oil in a frying pan until it sizzles, add few pork skewers at a time, and brown lightly on one side. Turn them over, and brown lightly on the other side. Arrange the city chicken on top of the veggies. Combine water, vinegar, garlic, 1/2 of the salt and pepper. Pour mixture over meat cubes, and mix to coat. 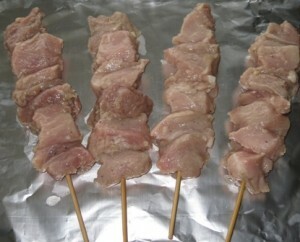 Leaving about 2 inches at the bottom of each skewer, arrange pork cubes on the skewers. I used 5-6 pieces of meat on each skewer, but would recommend only 4, for easier handling. Squeeze cubes together, and pat dry with paper towel. Set aside on a foil lined baking sheet. 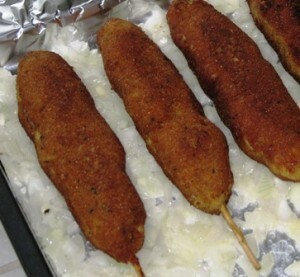 Blend bread crumbs with curry powder, and remaining salt and pepper. 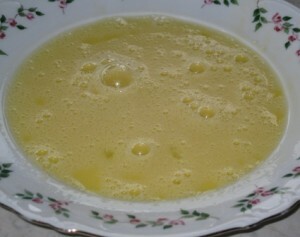 Dip the bread crumb coated pork into egg wash. Drip off any excess liquid. 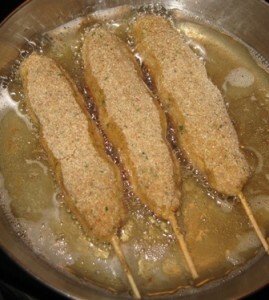 Dip for the second time in the flavored bread crumbs, and squeeze them gently to firm them up, as shown above. Clear off dripping from the frying pan. Add butter, chopped onions, celery and carrots, and saute for 1 minute. Spread the veggies evenly on a foil lined baking sheet. Bake in a preheated oven, at 275 degrees F, for about 45-60 minutes, or until meat is no longer pink. These may be served hot, or at room temperature. This City Chicken is suitable for freezing. It also may be stored in the refrigerator for several days, and reheated before serving. 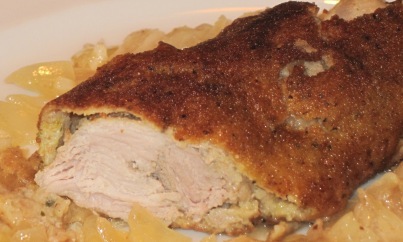 City chicken is a Polish dish that is generally made around the Detroit and Pittsburgh areas. Chicken was more expensive than other meats, so they made these to replicate chicken legs. 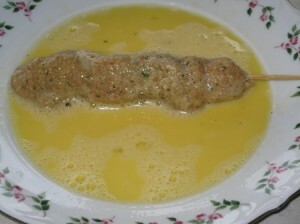 It is made with alternating cubes of pork and veal on a skewer, then seasoned with salt and pepper, rolled in flour, then beaten eggs, then bread crumbs. Fry in pan till browned (in a few tablespoons of vegetable oil).Put into baking pan with just enough water to cover bottom of pan, then dab a few pats of butter on them.Bake for about 45 minutes @ 350 degrees. Thank you very much for your input. Very interesting history. Sound like the recipe I have, differs slightly from yours. Nonetheless, a great dish to prepare.